After finishing 50th among running backs in fantasy points per game last year, Henry’s ADP has skyrocketed to 20th, and I’m less bullish. While his workload should increase, he’s still stuck in a committee. Despite being drafted (on average) more than a full round later in PPR leagues, Dion Lewis has out-snapped Henry 22 to 19 with the first-team offense this preseason. Henry will dominate goal-line work but will likely (based on prior-career usage) be a non-factor in the passing game. Keep in mind, targets are worth 2.74 times as much as a carry for running backs in PPR leagues. Henry will also likely receive the majority of early down work, but Lewis (who has ranked top-five in missed tackles forced per attempt and yards after contact per attempt in two of the past three seasons) has actually been the more efficient runner throughout their careers. As it stands, Henry is a fade for me in PPR leagues, lacking bell cow upside and week-to-week consistency. Olsen’s numbers looked atrocious last season but are heavily skewed by injury. He suffered a fractured foot in Week 2, was eased back into playing time when returning, and then averaged 14.0 expected fantasy points per game over the final three weeks of the season. There’s a new offensive playcaller in Carolina, but Norv Turner has actually been one of the most favorable playcallers for fantasy tight ends throughout his career. Given Olsen’s long history of elite production (top-seven among tight ends in fantasy points in each of the prior five seasons), I’m willing to write off his 2017 season as an injury-fueled outlier. He’s a fine value at ADP (TE5). Not only was Hilton a disappointment from a fantasy-point-per-game perspective, but he was barely even usable at all last year. Despite playing in all 16 games last year, a whopping 49.3 percent of his total fantasy points came in just three (18.8 percent) of his games. However, much of Hilton’s fantasy woes can be explained away by Andrew Luck missing the entirety of last season. Throughout his career, Hilton averages 15.1 fantasy points per game with Luck in the lineup and only 11.3 without. For perspective, that would have been the difference between finishing 10th and 31st at the position last year. 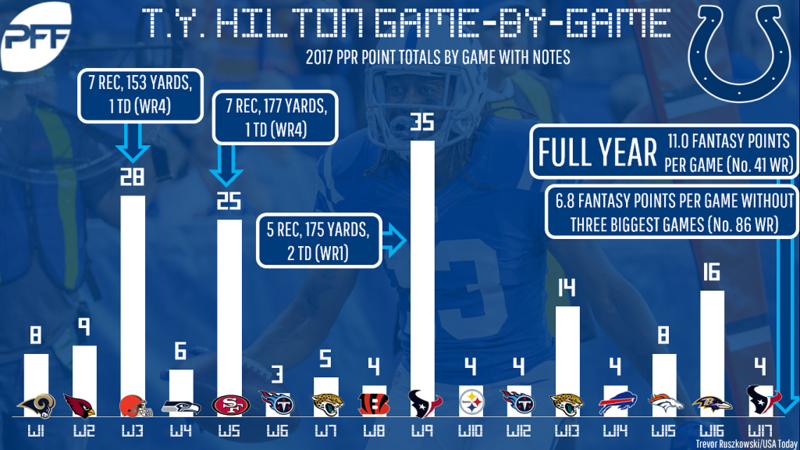 Hilton is appropriately priced at WR12 but should exceed that expectation if Luck is truly 100 percent, though that’s not a given. I highlighted Sanders as one of “My Guys” earlier this month, based on historical production, a perceived improvement at the quarterback position (from Trevor Siemian, Brock Osweiler, and Paxton Lynch to Case Keenum), and the fact that drafters were neglecting the fact that he played hurt for the majority of last season. Since then, his ADP has jumped four spots, but he’s still a strong value. With the first-team offense this preseason, Sanders has been targeted on a whopping 14 of Keenum’s 32 attempts (43.8 percent). He’s also been operating more out of the slot this preseason (64.9 percent of his routes, compared to 21.2 percent last regular season). Keep in mind, Adam Thielen finished eighth in fantasy points last year serving as Keenum’s primary slot option (51.1 percent of his routes). Despite the presence of second-round running back Ronald Jones, Barber has dominated first-team usage this preseason. Barber has played on 33 of the team’s 50 (66 percent) first-team snaps this preseason, while averaging 4.1 yards per carry to Jones’ 1.4. Over the final five weeks of last season, Barber averaged 15.6 carries and 2.6 targets per game. Now, apparently cemented as the starter, and with scatback Charles Sims out of the picture (he was active for all five of these games last year), Barber has even more potential in 2018. He’s a strong value with decent upside at current ADP. In the words of our own Tyler Buecher, “Someone gave Kyle Shanahan a wide receiver who ran a 4.27 40-yard dash at the combine. That should be illegal.” Goodwin has, reportedly, cemented himself as the team’s top receiver this preseason, and already had shown strong rapport with Jimmy Garoppolo last year, averaging 14.7 fantasy points per game in games he started last season. For perspective, that would have ranked tied for 12th-best at the position last year, well above his full-season finish and current ADP. Although I’m still very high on Pierre Garcon, and there are safer options around his ADP, he’s a decent value. After being behind Zach Ertz in Philadelphia, Matt Nagy and the Chicago Bears made Burton the fourth-highest-paid tight end in the NFL (by average guaranteed salary per year). All offseason, Burton has been hyped up as Chicago’s version of Travis Kelce (Nagy did call plays for the Chiefs last year). Bears beat writer Brad Biggs went so far as to say he expects Burton will challenge Martellus Bennett’s franchise record for most receiving yards (916) in a single season by a tight end. If preseason usage is any indicator, that might just prove true. Burton has been targeted on six of Mitchell Trubisky’s 16 pass attempts (38 percent) this preseason. Still, his current ADP feels far too high for someone with only 63 career receptions. For Cooper, there are two massively positive takeaways from Oakland’s training camp. First, new head coach and offensive playcaller Jon Gruden has stated a desire to run the offense through Cooper. He said in June, “That’s been one of our No. 1 objectives, to make [Cooper] the main vain of our pass offense.” Cooper’s training camp usage as well as Oakland’s offseason moves seem to indicate a desire to have Cooper run more out of the slot this season. This would be a great boon to Cooper’s fantasy potential. Over the past two seasons, Cooper ranks second-best in yards per route run from the slot, but below average when running routes split out wide. Since entering the league, Cooper has ranked 33rd, 18th, and 28th in fantasy points per game. Considering there is little discount on Cooper’s disastrous 2017 season, he’s not one of my draft-day targets, but I wouldn’t be shocked if this is the year he finally breaks out. I haven’t written much on Mixon this offseason, so allow me to expand a bit here. Mixon graded out 17th-best of 58 qualifying running backs last year (Giovani Bernard ranked 34th), implying he played better than his production and efficiency suggest. Mixon was also far more impressive in college. In 2016, for example, of over 100 qualifying Power-5 running backs, Mixon ranked first in yards per carry, first in yards per route run, first in PFF grade, and first in PFF pass grade. Earlier this offseason, Bengals player personnel director Duke Tobin said Mixon would be the team’s “bell-cow running back” in 2018. There hasn’t been much on the subject since, but I do think that’s what would be best for the offense. While Bernard has been effective as a pass-catcher throughout his career, Mixon’s college efficiency suggests he’s even better, ranking fourth-best of 162-qualifying running backs (since 2014) in yards per route run. As it stands, with better volume and efficiency a likelihood, but not a given, Mixon is an appropriately priced but boom-or-bust draft pick at current ADP. Despite signing an offseason contract that made him the sixth-highest-paid wide receiver in the NFL, Watkins is someone I’m fading at current ADP. Throughout Andy Reid’s coaching career, Reid has barely been able to support one fantasy relevant wide receiver, let alone a top-two fantasy tight end (Travis Kelce), a fantasy WR1 (in Tyreek Hill), and a fantasy WR3 (Watkins), as ADP suggests. Just as Watkins’ lack of volume last year (86th in total targets) is a concern, his preseason usage this year is even more alarming. With the first-team offense, Watkins has seen just seven targets to Hill’s 16, despite Watkins playing on three more snaps. On those targets, Watkins totals just 14 yards to Hill’s 182. That sort of upside implies massive fantasy upside for Drake. (Keep in mind the importance of targets for fantasy running backs from the Henry section.) There’s still the question of whether he can handle that sort of usage. He was used as more of a complementary piece throughout the entirety of his career (college included) prior to last season but as alluded to here, Gase does have an extensive history of utilizing a bell cow running back (and to great fantasy success) in his offense. As it stands, he’s a terrific value at ADP, and the fact that his “handcuff” (Gore) is going undrafted in most leagues only helps his cause. Lockett was our highest-graded wide receiver coming out of college in 2014. In his rookie season, he averaged 12.5 fantasy points per game over his last 12 games (including postseason). The following season, Lockett suffered a PCL tear in September and then fractured his tibia and fibula in December. Lockett played in all 16 games last season but was never quite right. Head coach Pete Carroll said in June of this year, “ was a struggle for him, the offseason for certain, but throughout the season itself he was not able to do things in the same manner that he had done it in years past.” Now, Lockett is reportedly 100 percent and signed a three-year extension with the team. Doug Baldwin, meanwhile, is self-assessed to be only 80 to 85 percent healthy and won’t be at 100 percent at any point this season. That’s bad news for Seattle’s offense but good news for Lockett owners. Seattle lost 172 combined targets between Jimmy Graham and Paul Richardson this offseason, to be replaced by (presumably) Ed Dickson and the 34-year-old Brandon Marshall. Dickson hasn’t topped 30 receptions in a single season since 2011 and Marshall ranks last in yards per target among all wide receivers with at least 150 targets over the past two seasons. Graham and Richardson also combine to leave behind 20 targets inside the 10-yard line (from last season), which is as much as or more than 11 teams totaled last year. Although I’ve said this before, I think this is the year Lockett finally breaks out.